A 74-year-old obese woman with a long-standing history of uncontrolled type II diabetes mellitus was admitted to the hospital for an acute asthma exacerbation. She developed severe abdominal pain on the 6th day of admission. The abdomen was tender to palpation in the right lower quadrant, right costovertebral angle tenderness was present, bowel sounds were present and there was no rebound tenderness. Later in the day the patient developed a fever, hypotension, tachycardia and leukocytosis. She was noted to be hyperglycemic for several days. She was sent to our department for a CT scan of the abdomen and pelvis. 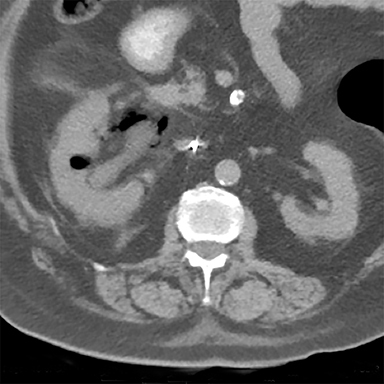 A CT scan of the abdomen and pelvis performed without IV contrast, due to the patient’s allergy to contrast, showed gas within the right renal parenchyma, collecting system, ureter and perinephric space. There was also infiltration of and fluid in the right perinephric fat and mild right hydronephrosis. No fistula was seen between the gastrointestinal and genitourinary tracts. 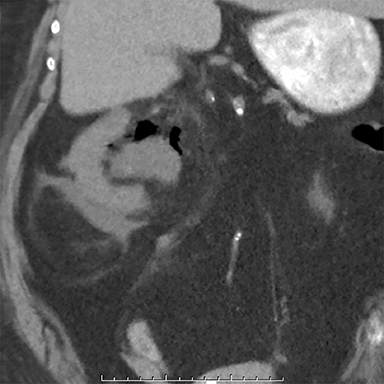 Clinically, most patients present symptomatically with fever and abdominal, flank or back pain consistent with signs of pyelonephritis and with laboratory studies that show leukocytosis and occasionally thrombocytopenia.3-5 The diagnosis of EPN is difficult based on history, physical exam and laboratory values alone; thus, radiological imaging is necessary to confirm the diagnosis. Our patient with a longstanding history of poorly controlled diabetes mellitus suffered an acute episode of EPN complicated by septic shock and renal failure during her hospitalization for an acute asthma exacerbation. She was treated conservatively with antibiotics for the pyelonephritis and with a ureteral stent to relieve the hydronephrosis resulting from her unstable critical condition. Although nephrectomy is considered the most efficient treatment for EPN, many patients become too unstable for invasive procedures. Thus, conservative methods with medical management and minimally invasive procedures should be aggressively pursued. Our patient recovered with only conservative medical management. Emphysematous pyelonephritis is a potentially serious fulminant bacterial infection of the kidneys characterized by gas in the collecting system, renal parenchyma and perinephric tissues. Prompt diagnosis of EPN is imperative and should be followed by aggressive medical management with antibiotics to minimize life-threatening complications and the potential need for more invasive intervention. Michaeli J, Mogle P, Perlberg S, Heiman S, Caine M. Emphysematous pyelonephritis. J Urol. 1984; 131:203-208. Ubee SS, McGlynn L, Fordham M. Emphysematous pyelonephritis. Br J Urol Int. 2010;107: 1474-1478. Kuo CY, Chen TC, Lin WR, et al. Clinical features and prognostic factors of emphysematous urinary tract infection. J Microbiol Immunol Infect. 2009; 42:393-400. Wan YL, Lee TY, Bullard M, Tsai CC. Acute gas-producing bacterial renal infection: Correlation between imaging findings and clinical outcome. Radiology. 1996; 198:433-438. Huang JJ, Tseng CC. Emphysematous pyelonephritis: Clinicoradiological classification, management, prognosis, and pathogenesis. Arch Intern Med. 2000;160:797-805. Craig WD, Wagner BJ, Travis MT. 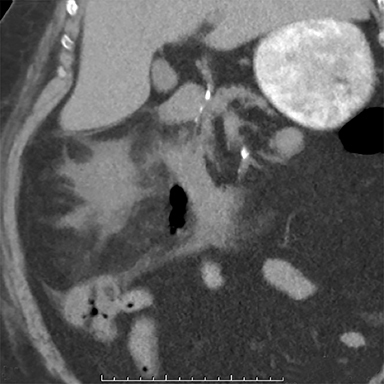 Pyelonephritis: Radiologic-pathologic Review. Radiographics. 2008; 28:255-276. Prepared by Nancy Kim while a Medical Student and Dr. Machnicki while practicing in the Department of Radiology, serving as Associate Chair, Education, at Lenox Hill Hospital, North Shore LIJ Medical Group, New York, NY.